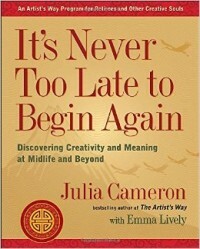 "It's Never Too Late To Begin Again"
This is an 8-week book study on It's Never Too Late to Begin Again - Discovering Creativity and Meaning at Midlife and Beyond by Julia Cameron, bestselling author of The Artist's Way. Facilitated by Dr. Cindi Britton, this class is for anyone who wishes to expand their creativity. It is not meant only for "declared" artists; it aims at those transitioning into the second act of life - leaving one life behind and heading into one yet to be created. This may mean retiring, facing an empty nest or simply rejuvenating the creative spirit!